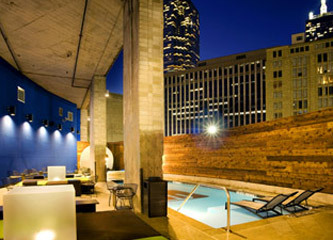 The greatest addition to the downtown Dallas scene is the Aloft Dallas Downtown hotel. Located in the historic building in the business district, this loft inspired hotel is a vibrant new hotel option. We're just steps from City Hall and the Dallas Convention Center, with easy access to the American Airlines Center, Arts District, and much more! Far from ordinary, Aloft Dallas Downtown offers guests a new experience with a fun scene where you can mix and mingle at our bar and lounge area. After enjoying the social scene downstairs, retreat to our aloft guestrooms, featuring our ultra-comfortable signature bed, oversized showerhead, custom amenities by Bliss® Spa and more. Our plug & play connectivity station charges all types of electronics and links to the 42" LCD TV to maximize work and play.